Today is Canada Day, and what better way to celebrate that then by posting a review of a distinctly Canadian movie. 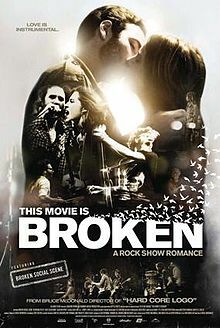 This Movie Is Broken is a sort of live concert movie with a very loose romance story taking place during the performances. It was written by Don McKellar and directed by Bruce McDonald, both notable Canadian filmmakers that are pretty much unknown throughout the rest of the world. It’s not that they’re not talented (although I hated haaaaaated McDonald’s The Tracey Fragments), it’s just that the world doesn’t seem to want that much of their particular Canadian perspectives. What do I know though, I’m just seeing this from inside Canada. The stars of the film are Broken Social Scene, an amazing Canadian band that I had been resisting listening to for years because I didn’t want to fall into that hipster garbage and how dumb was I for that? Their songs are anthems, powerful collections of musical collaborations between many of their FIFTEEN members. Their creativity blows me away. The other two stars of the movie are Greg Calderone and the breathtakingly gorgeous Georgina Reilly, playing two people that have known each other since childhood. Bruno (Calderone) has been carrying a torch for Caroline (Reilly) since then, and now, fifteen years later, they wake up after spending the night together. The entire movie takes place on that day, a day when BSS is giving a free concert in Toronto, leading to Caroline and Bruno enjoying said concert. The dialogue is natural, improvised, and generally takes a back seat to the songs. I’d say it was guerrilla film making, but it’s actually more impassioned than that. McDonald gets the shots he needs, tells the story, and the band provides a gorgeous background for the whole tale. It’s not a perfect movie, but it’s a far better pastiche of scenes than the pretentious wankery of The Tracey Fragments. There are some scenes that are captured so beautifully that it makes my heart ache, and if I’m being honest, they usually contain the lonely pretty girl, Caroline Rush. She’s the kind of girl I used to write (probably) bad poetry about, you just want to know her, and I’m going to stop before I start writing “Ode to Caroline Rush” here.